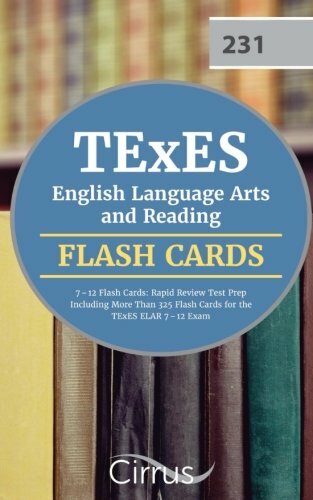 TExES English Language Arts and Reading 7-12 Flash Cards: Rapid Review Test Prep Including More Than 325 Flash Cards for the TExES ELAR 7-12 Exam is a flash card book offering test-takers a full review of the subject matter covered on the TExES English Language Arts and Reading exam. Cirrus Test Prep’s TExES ELAR flashcards cover: A REVIEW of: Reading • LITERATURE • INFORMATIONAL TEXTS AND RHETORIC Language Use and Vocabulary • GRAMMAR • VOCABULARY • DIVERSITY • RESEARCH BASED ACQUISITION Writing, Speaking, and Listening • WRITING • SPEAKING AND LISTENING • TEACHING AND ASSESSING COMMUNICATION About Cirrus Test Prep Developed by experienced current and former educators, Cirrus Test Prep’s study materials help future educators gain the skills and knowledge needed to successfully pass their state-level teacher certification exams and enter the classroom. Each Cirrus Test Prep study guide includes: a detailed summary of the test’s format, content, and scoring; an overview of the content knowledge required to pass the exam; worked-through sample questions with answers and explanations; full-length practice tests including answer explanations; and unique test-taking strategies with highlighted key concepts. Cirrus Test Prep’s study materials ensure that new educators feel prepared on test day and beyond.